The 6-position modular jack is commonly referred to as RJ11 which may or may not be correct. Using RJ terms often leads to confusion since the designations refer to very specific USOC wiring configurations designation. RJ means"registered jack." The term should only be used for jacks that are connected directly to phone company circuits. Each of the basic jack styles can be wired for different RJ configurations. For example, the 6-position jack can be wired as an RJ11C (1-pair), RJ14C (2-pair), or RJ25C (3-pair) configuration. An 8-position jack can be wired for configurations such as RJ61C (4-pair) and RJ48C. The keyed 8-position jack can be wired for RJ45S, RJ46S, and RJ47S. Internal wiring in the jack may have different colors from the wiring that goes to the jack. The "tip" is near ground potential. The "ring" is negative to ground and tip, and generally at about CO battery potential, nominally -48 vdc in the on-hook state. In the diagrams below, you are looking into the opening of the jack. Wires insIDe most phone jacks are usually solid- colored, not striped. 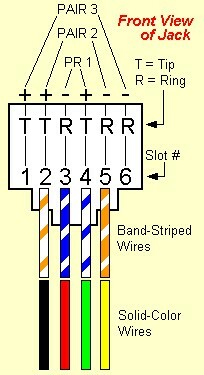 Older installations typically used "quad" wire, using the green-red black-yellow color code shown. For new installation, "twisted-pair" wire, designated Cat 5 or higher, is recommended. The diagrams and some of the info above came from Hubbell, a manufacturer of devices. Other information comes from Siemon, another supplier of telecom hardware.